WASHINGTON (AP) -- During the depths of the auto industry's collapse a year ago, Ford told shareholders at its annual meeting that they might have to wait until 2011 before the company started making money again. It turns out they didn't have to wait that long. Thanks to well-reviewed cars and trucks, aggressive cost-cutting and goodwill from consumers for avoiding a taxpayer bailout, Ford Motor Co. has posted four straight profitable quarters. It has also more than doubled its stock price from below $5 last May, and seized market share from floundering rivals such as General Motors Co. and Toyota Motor Corp. Ford now expects to be solidly profitable this year. And that likely means happier shareholders at Thursday's 2010 Ford meeting in Wilmington, Del. "Things are going very well for Ford," said Erich Merkle, president of the consulting company Autoconomy.com in Grand Rapids, Mich. "If anything, they're going to be confident." But there could still be some tough questions for Ford Chairman Bill Ford and CEO Alan Mulally. Ford had $34 billion in debt at the end of the first quarter, much of it stemming from the company's 2006 decision to mortgage its factories and other assets for $23.5 billion to restructure its operations. The debt puts Ford at a disadvantage to GM and Chrysler Group LLC, which have only a fraction of Ford's debt after shedding most of it during bankruptcy reorganization last year. Ford spent $1.5 billion in interest last year, or $311 per vehicle it sold worldwide. Ford Chief Financial Officer Lewis Booth says the company has a plan to pay down the debt, but he hasn't given details. Ford paid off $3 billion in April. Fitch Ratings, which upgraded Ford's debt ratings last month, says Ford now has enough cash -- $25 billion at the end of the first quarter -- and better access to credit markets to begin paying down its debt. 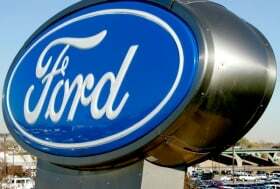 The economic outlook also could hamper Ford's progress. U.S. sales are expected to rise to 11.5 to 12 million vehicles this year, but that's still well below the 17 million of just five years ago. Unemployment remains stubbornly high, sapping the pool of possible buyers. Ford pays more in labor costs than GM and Chrysler. "Ford's performance has been outstanding, but there seem to be a growing list of factors that suggest profitability in subsequent quarters will fail to match what Ford posted in (the first quarter)," Credit Suisse auto analyst Chris Ceraso said in a recent research note. Ceraso said global expansion costs, rising prices for raw materials like steel, high incentives in the U.S. and Europe and declining profitability at Ford Credit all could affect the company as the year progresses. Stockholders are expected to call for greater input on executive pay at the meeting. Mulally's $17.9 million pay package was one factor hourly workers cited last fall when they voted down further wage concessions that were accepted by workers at GM and Chrysler. Another shareholder proposal demands more transparency on Ford's political contributions. • Ford posted a $14.6 billion loss in 2008. In 2009, it made a profit of $2.7 billion. • In the first quarter last year, Ford lost $1.4 billion. This year, it posted net income of $2.1 billion in the first quarter. • Ford's U.S. market share reached 16.6 percent in the first quarter, up from 13.9 percent in the same period a year ago. The jump in market share was Ford's biggest since 1977. • Ford shares closed at $4.96 last May 13, the day before the 2009 annual meeting. On Tuesday, shares closed at $12.31. With the recession over and auto sales slowly improving, Ford will likely benefit more than many of its rivals, analysts say. Ford has been taking share from Toyota, which has recalled more than 8 million vehicles globally because of safety issues. It has newer products and a perception of higher quality than Chrysler and doesn't suffer from the taint of the federal bailout as GM does. New Ford vehicles, such as the Fiesta subcompact for global buyers and Explorer SUV for North America will likely help the automaker expand into new markets and grab a greater share of U.S. sales, Merkle said. Those vehicles go on sale in the U.S. later this year. There also has been a change in Ford's mindset since Mulally's arrival in 2006, according to Michael Robinet, an automotive analyst with CSM Worldwide. The Ford Focus, for example, used to be a bare-bones compact car that Ford could churn out in mass quantities. Now, Ford sells it more profitably because it's including features drivers pay more for, such as the Sync voice-activated calling and entertainment system and Ford's new touch screen interior display. "Building vehicles just for the sake of volume, those days are behind us," Robinet said. "If you are going to build a vehicle, build it for a reason and try to make money."